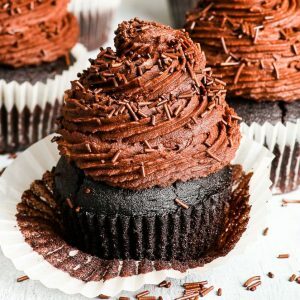 Pure chocolate bliss in every single bite – these gluten free vegan chocolate cupcakes are bound to become everyone’s favourite. They look amazing, taste spectacular, and are super easy and quick to make! Plus, you couldn’t possibly guess that they contain no gluten, no dairy and no eggs! 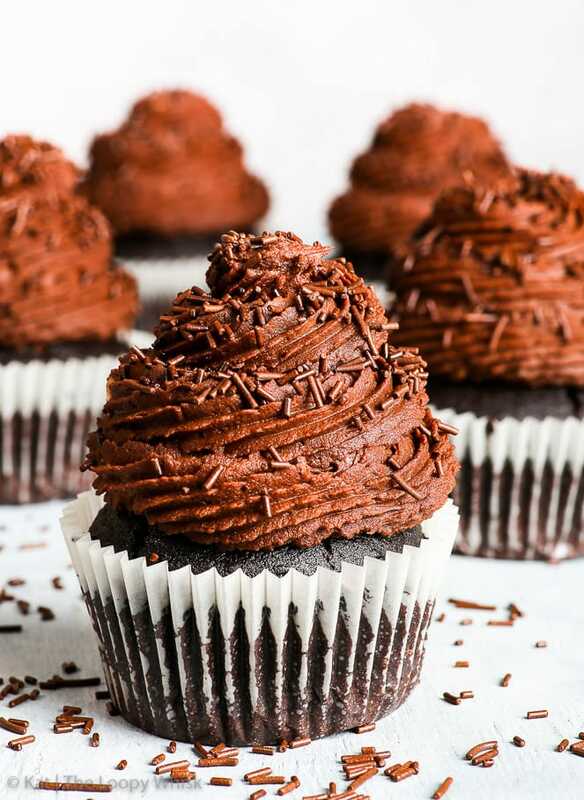 There’s something terribly charming about dark, almost fudgy chocolate cupcakes, topped with a small mountain of swirly, fluffy chocolate frosting. It’s basically chocolate on chocolate… with even more chocolate in the form of dark chocolate sprinkles. Yes, I’ve just used the word chocolate SIX TIMES in only one paragraph. This will be a chocolatey post, folks. The chocolatey post – with a chocolatey recipe for gluten free vegan chocolate cupcakes. Remember last week? We talked about how vegan baking is actually a piece of cake, and today we’re continuing that story. 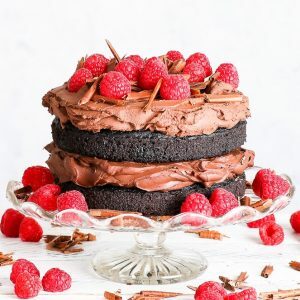 The brilliant thing about last week’s vegan chocolate cake recipe is that it’s easily adapted to cupcakes – and that’s precisely what I’ve done here. And that, in essence, is what baking of any sort is all about. 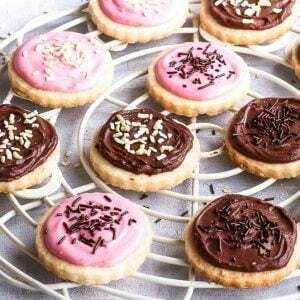 A few basic recipes that you can modify and adapt to any shape, size or flavour. And this recipe is definitely one that you’ll find yourself coming back to again and again. 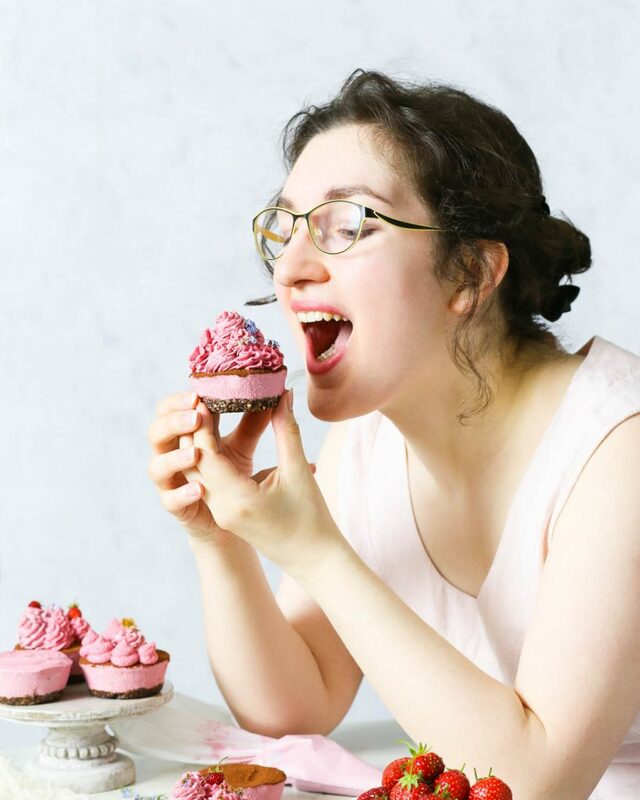 Cupcakes, cakes, muffins – a few small tweaks and vegan chocolate goodness of all sorts is within your reach. Making the vegan cupcake batter involves mixing all the ingredients together and baking them. Aaand… that’s it. Yes, there’s cocoa powder AND melted chocolate in the frosting – double the chocolate, double the flavour, double the deliciousness. The end result is utter chocolatey perfection. 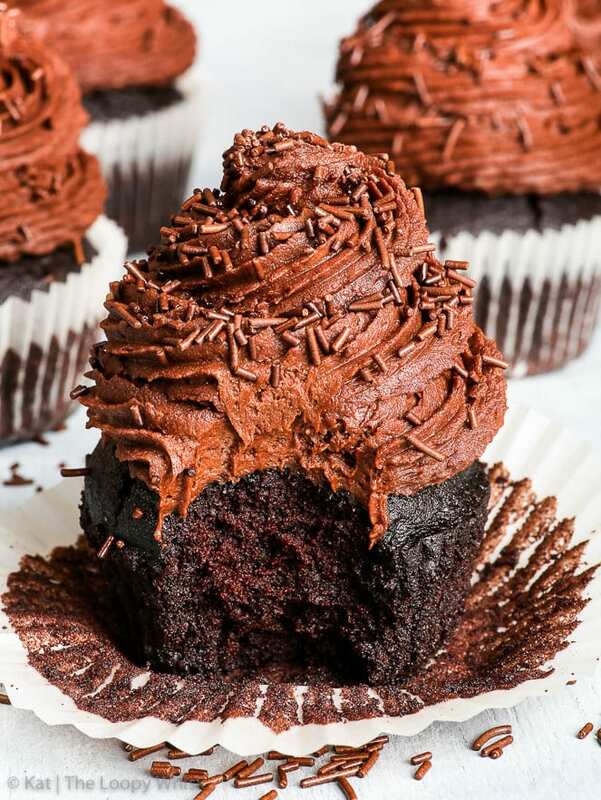 Seriously, there’s nothing not to love about these gluten free vegan chocolate cupcakes. They’ve even passed the non-vegan/non-GF test: nobody could tell that they contain no gluten, no eggs and no dairy! And it all comes together within 45 minutes. 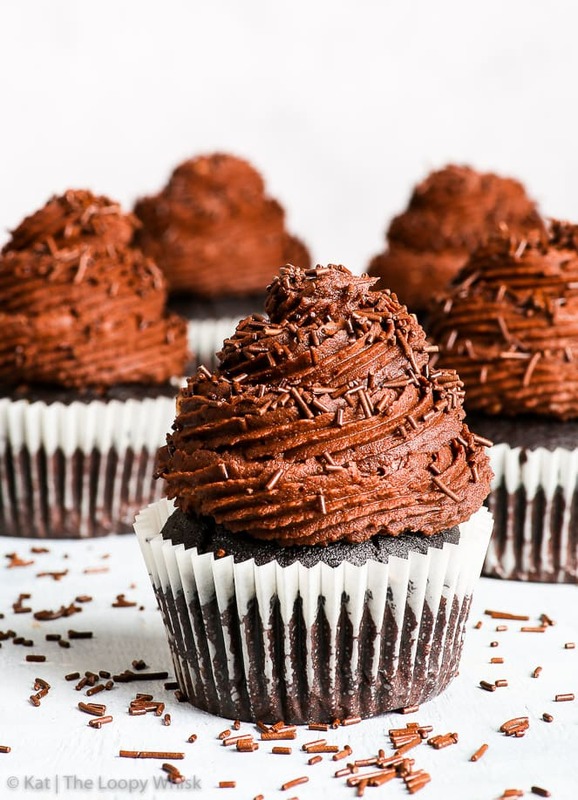 Yes, this vegan chocolate cupcakes recipe is the very definition of EASY and QUICK. But the results… oh, the results. Pure chocolate bliss in every single bite. On that note: apparently I’ve used the word chocolate 25 times in this post (26 counting this sentence). That pretty much speaks for itself, doesn’t it? When it comes to gluten free flour blends, I recommend using one with a very simple ingredients list. I use a Lidl Brand “Just Free” (available in UK), that only contains rice, potato and maize flour. However, people have had excellent results using Bob’s Red Mill all purpose GF flour and 1-to-1 baking flour. Alternatively, you can mix our own blend from rice flour, potato flour and maize flour. I get many questions about xanthan gum. This is a common ingredient in gluten free baking, acting like “glue” (the binding agent) in the absence of gluten. It gives your baked goods elasticity and flexibility, so that they don’t crumble away to nothing. When it comes to the frosting, you can either use a high quality coconut milk with few/no additives to get the coconut cream… or just buy straight-up coconut cream, if you want to avoid the extra step of separating the cream from the milk. You want your coconut cream frosting to be as fluffy as possible – I like to make it in my KitchenAid stand mixer, but a quality hand mixer will work just as well. I recommend the VonShef hand mixer, it works like a dream. Pre-heat the oven to 355 ºF (180 ºC) and line a cupcake baking tin with 12 cupcake liners. 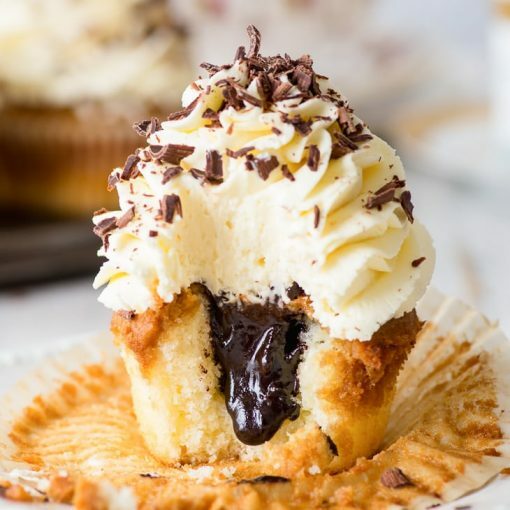 If you're uncertain about the quality of your cupcake liners, brush the inside with some vegetable oil for easier cupcake liner removal when eating. Mix the wet ingredients together, and add them to the dry ingredients. Stir well, until you get a smooth cupcake batter. Transfer the cupcake batter into the cupcake liners, so that you fill each cupcake liner about 3/4 full. Bake in the pre-heated oven at 355 ºF (180 ºC) for about 35 minutes or until the tops are springy/bouncy to the touch and an inserted toothpick comes out clean. 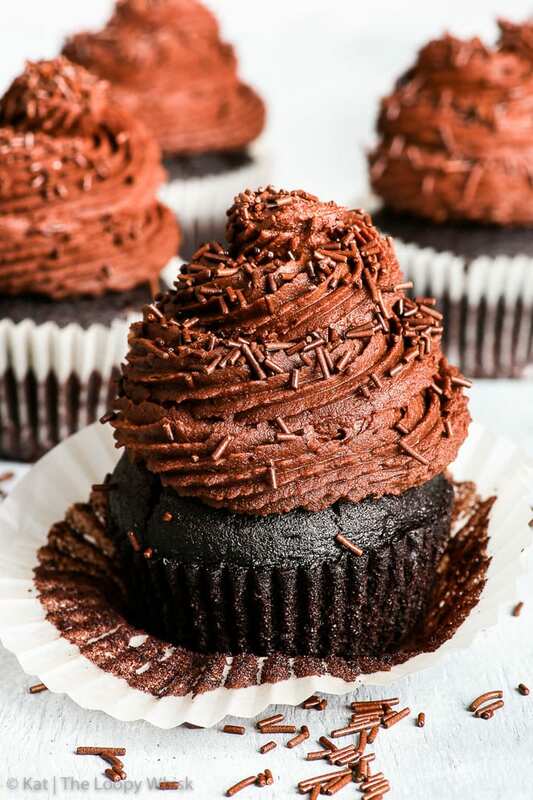 While the cupcakes are baking, prepare the vegan chocolate frosting. In a stand mixer with a paddle attachment or using a hand mixer with the double beater attachment, beat the coconut cream until smooth and slightly increased in volume. Add the powdered sugar. Gradually increase the mixer speed from low (at the beginning while the powdered sugar is being incorporated into the coconut cream) to high. Beat at high speed for about 5 minutes, or until the frosting is fluffy and increased in volume. Add the cocoa powder and beat until evenly incorporated. The cocoa powder will make the frosting firm up slightly. Add the melted chocolate and beat until evenly incorporated. As the chocolate cools, the frosting can become a bit hard – at this point add the almond milk if needed. It will loosen up the frosting, bringing it to piping consistency. Using a piping nozzle of choice (I've used this Wilton Star Tip No. 32 (affiliate link) – it's a favourite! ), pipe the vegan chocolate frosting on top of the cooled cupcakes. The gluten free vegan chocolate cupcakes keep well in a closed container in a cool dry place for about 3 - 4 days. Note 1: If you’re a vegan who’s concerned about bone char used in refining sugar, you can see a list of companies that don’t use bone-char filters on the PETA website. Note 2: You can get coconut cream by putting coconut milk (with a high coconut content and without too many stabilisers/preservatives) into the fridge for a few hours – without shaking! The coconut milk will separate into coconut cream (that you'll need in this recipe) and coconut water (which is great in smoothies). Looking for more sweet vegan goodness? I’ve got just the recipes! That frosting looks so amazing!! What GF flour do you use? These sound WONDERFUL. The texture looks incredible, and they look so unabashedly CHOCOLATE! Thanks Kat 🙂 Feel better now. Plan on halving this and your vanilla cupcake recipe and making both. (Love the simplicity and pretty interesting I don’t have to worry about milk/vinegar curdling or a flax egg forming properly!) Going to add espresso powder to both because I need mocha cupcakes and will let you if they’re a success! Hi Alisha! 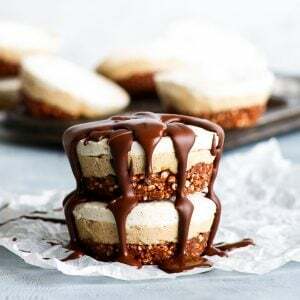 Love the idea of mocha cupcakes (adding espresso is always a good idea 😉 ). I find that flax and chia eggs often mess with the texture of my bakes, so I’m not a huge fan of them. I know some people have great success using them, but I try to avoid using them in my baking. Looking forward to hearing how the cupcakes turned out! I made this recipe with a bit of twist. I wanted to give my guest a surprise in the middle so I froze nutella first and added cornstarch instead of xanthan gum (I didn’t have that). Also I added 3/4 cups of nutella in the batter. Then i spoon batter in muffin cups till half then placed the frozen nutella and place a bit of batter to cover the nutella. It was amazing moist and delicious. I ate more than my guest. Thank you thank you and plenty more love for providing me with a guide to bake a perfect chocolate cupcakes. Oh yeah k forget i called it chocolate lava cupcakes. These cupcakes taste amazing! I do have 2 side notes though… First the cook time of 35 minutes? Mine were done in 18-20 minutes. And the liners were very greasy, is there a way to lessen that? Hi Whitney! I’m so happy to hear you liked the cupcakes! Regarding the baking time: I think it depends on how cakey or fudgy you like your cupcakes, and how well calibrated your oven is. I know some ovens which are even up to 20 degrees off, which can dramatically change the baking time required. And I like my cupcakes not too brownie-like, so I baked them a bit longer. 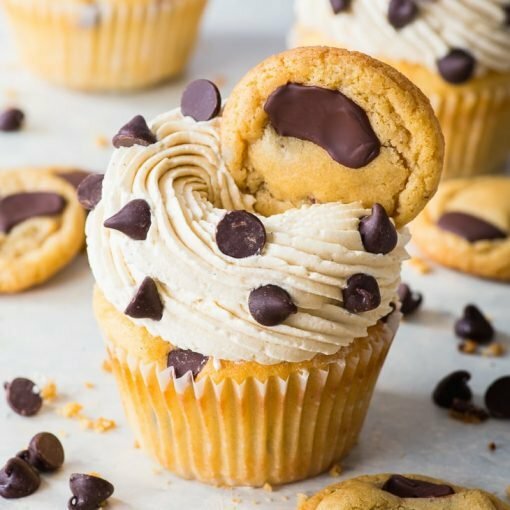 As for the cupcake liners: I haven’t had that experience, but especially if the cupcakes themselves felt too oily/greasy, maybe decrease the amount of vegetable oil? Hi Kat, I’m looking for dessert recipes for someone with lots of allergies, including coconut. 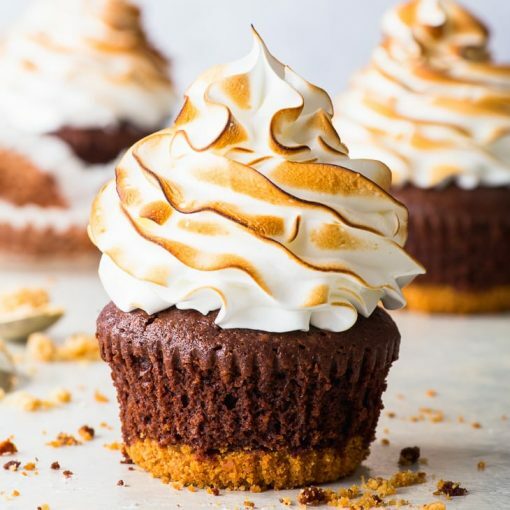 This recipe looks almost perfect – is there an alternative to the coconut cream for the frosting I could use? Hi Jennifer! If cashew nuts are not a problem, you could make a cashew cream (like in my raw vegan coffee cupcakes). If all nuts are a problem, maybe try a tofu or vegan butter based frosting? Would either regular sugar or powdered sugar work instead of caster sugar? If so, would the amount change? Hi Cathie, an equal amount of regular sugar will work just fine (I’m assuming you mean in the cupcake batter). Nice enough, but are you sure the quantities are right? I put in half the ‘milk’ and I thought it was still too liquid. I’ve looked at other similar recipes and they use far less ‘milk’. Also the quantity produced made rather more than 12, though I guess some people like bigger… I did find the cooking time about right, though, – perhaps five minutes less. 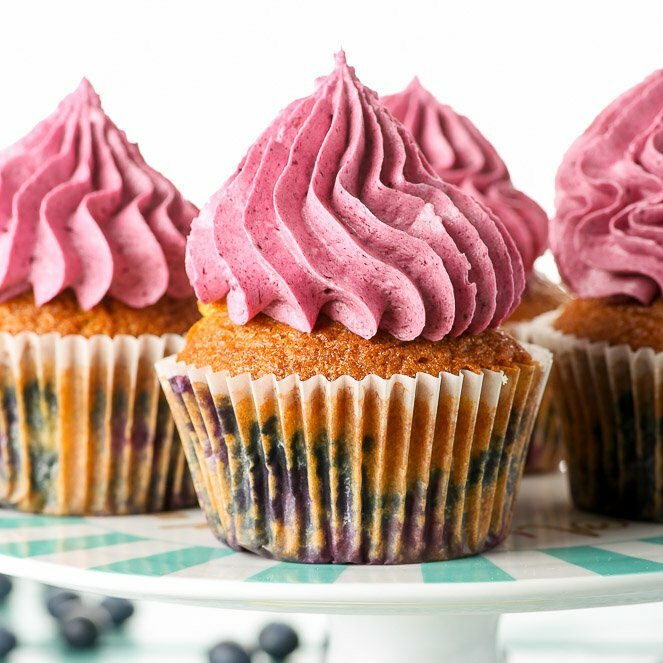 The quantities are correct – the batter is quite liquid, but this ensures that the final cupcakes are really moist and scrumptious 🙂 The quantities stated worked well for my standard sized muffin/cupcake pan, but I know that these can vary across countries. Hiya, can you freeze the frosting please? Thank you! Hi Sophie, I think you should be able to freeze the frosting, but maybe do a trial run where you only freeze a small bit, just to see how it behaves? Is that the same temp for fan forced ovens? In general, for a fan forced oven just decrease the oven temperature by 20 degrees as compared to a conventional oven.